When designing any type of facility or new construction, taking into account the surrounding climate will be very important in order to take proper precautions against future weather problems. Things like overbearing heat, high winds, heavy rain, etc. can take a major toll on a structure that is not built to deal with these issues. Panel Built provides a number of products and designs that can help you solve these problems in your facility. Our salespeople and dealers have great experience in all of the tips and tricks to protect your employees and property. In many cases, it can be very tough to determine which problems need addressing in your project. Depending on your location, you could have a wide range of potential issues. For this reason, our local Panel Built dealers make great liaisons between us and the end customer. Our dealers are able to provide the customer with the proper information and most prevalent weatherproofing needed in that particular area. Here are some of the most common ways we help with weatherproofing for our customers. For example, in your project is located in an area prone to hurricanes, there will need to be special steps taken for exterior buildings to withstand a potential storm. Looking at this chart, the large portion of the Southeast falls in this category, and builders in these areas have to take this into account. For Panel Built, we have to ensure that our guard houses will be able to hold a wind load of 180 mph. In a category 5 hurricane, there can expect to be sustained wind speeds anywhere from 160 mph to 190 mph, so the guard houses will be able to take some of the worst winds possible. For our guard booth, to stand up to these high-speed winds, we have to construct a special panel. 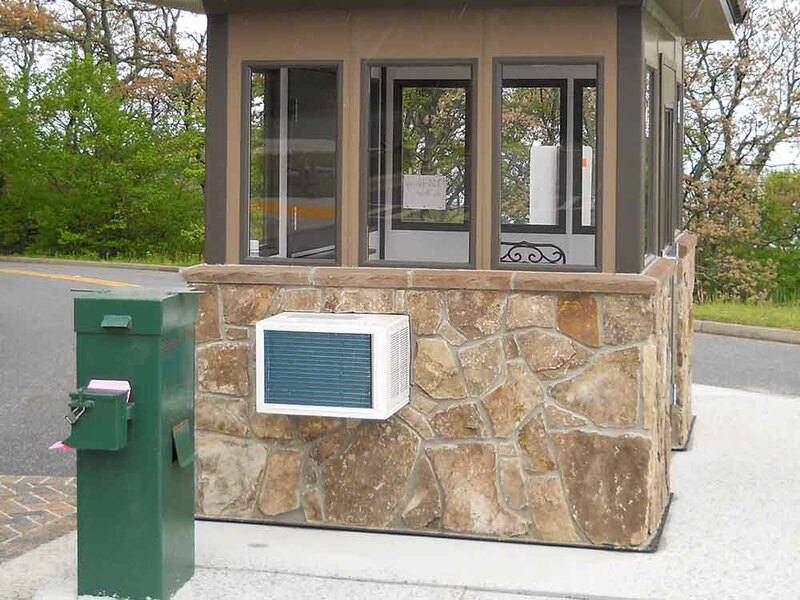 Our guard booths come with a standard wind load rating of 90 mph. However, by adding steel channel to the panels, we can increase that rating. For 110 mph ratings, 2 steel channels are needed per panel. For 120 mph ratings, 3 channels are needed per panel, and so on. By adding the steel channel, the panels themselves become studier, allowing them to withstand a stronger wind load. For our exterior buildings, rain guards can be very convenient especially in high precipitation areas. These rain guards protect the occupants from getting rained on during their daily routine. Seen most often on toll booths and guard houses, these are placed along the tops of the windows that are often open and closing. This will provide an extra shield to keep the rain off the booth occupants. These rain guards can also be placed over doors and other openings. Another point that is vital for the weatherproofing of your project is the HVAC system that will be installed in it. There are some projects where heating and cooling will not be an issue, but these are few and far between. Most projects will require it. Especially when looking at an exterior structure in a harsh environment (either hot or cold) a strong HVAC unit should be considered. 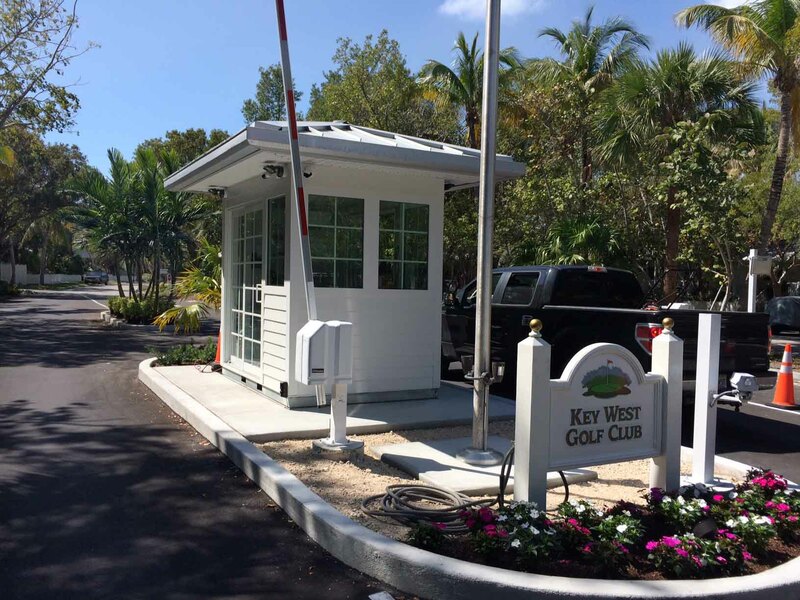 For example, a guard house placed in Florida. These buildings will typically be designed to have a 360-degree field of vision. That means there will be windows all the way around the structure. It will be very easy for heat to enter into the structure, and difficult to escape. During a Florida summer with heat around 100o F, the guard house would be more akin to an oven. For this reason, a constant, high level of airflow through the guard booth would be vital to the occupants. In some instances, a company will need to provide weatherproofing or soundproofing for equipment or machinery in their facility. A company can decide to do this for a number of different reasons. First, if they have just purchased new machinery, they might want to ensure they get the most out of it that they can. If the new machinery is stationed outside, this will require that the company build an enclosure around the machinery. This machine enclosure will offer protection to the machinery against the elements and potentially prevent damage from water or extreme temperatures. In the long run, these enclosures offer protection to companies’ investments in machinery and equipment. Similarly, machine enclosures often have very strict HVAC requirements. Oftentimes, the machine will need a specific environment to run optimally. This can be affected by things like temperature and humidity both of which can be altered by an appropriate HVAC system. Having the right sized HVAC system is important for this environment. If the system is too big for the enclosure, it will not be running long enough to regulate the humidity in the air, and if it is too small, it will not effectively regulate the temperature. Finally, no matter how well a facility is weatherproofed, there are still additional steps to be taken. No weatherproofing is complete without a thorough severe weather plan. Having a severe weather plan includes having a clear tornado safety route and plan in place in a pre-designated safety area. These plans should be posted throughout the facility with occasional drills in order to promote plan understanding and readiness. Having a severe weather plan includes having an emergency medical kit on hand at all times for any potential injuries that may occur. In the case of a tornado, ensure your pre-designated safety area is in your bottom floor, away from windows and corners. Overall, weatherproofing can include a number of different aspects of a facility. Panel Built offers many different products, designs, and fixtures that can help. 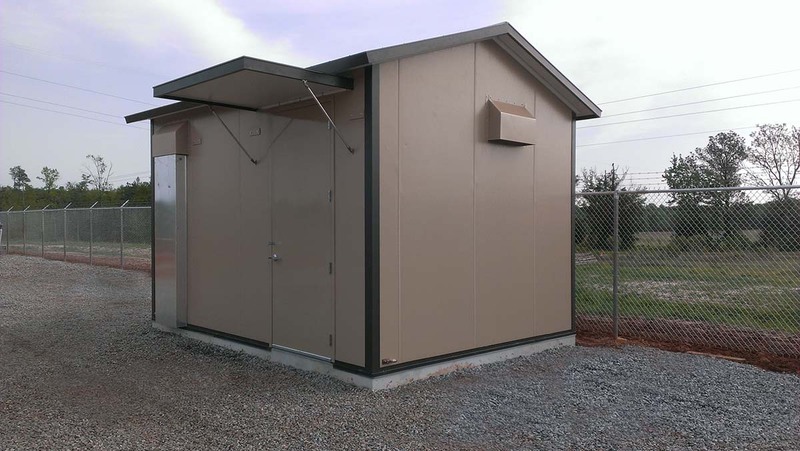 As the modular building experts, we have the product knowledge to fit you with the best product for your needs and environment. If you think that modular construction could be the right fit for your facility, give us a call at 800.636.3873 or send us an email at info@panelbuilt.com. We would be more than happy to answer any questions you may have about our product or your project.